The NFL's second-ever female coach says a strong, confident but humble approach is always best. Katie Sowers didn't get to the NFL by accident. 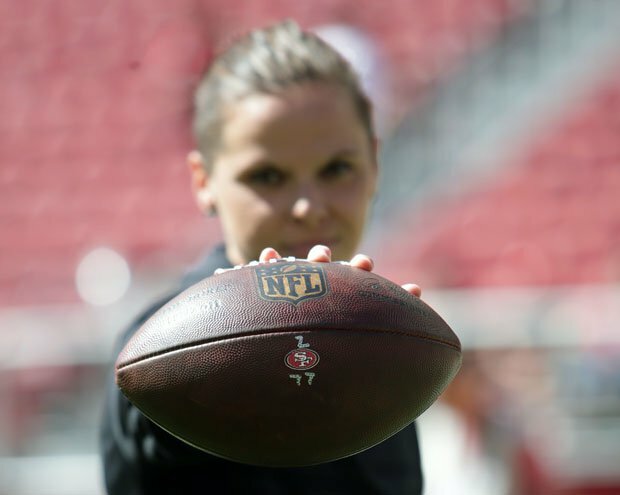 The San Francisco 49ers assistant offensive coach was only the second female ever hired to coach in America's most popular sport because of an unyielding work ethic, knowledge of sport and ability to teach the game. She's also good at teaching young people. Some of her best advice to young coaches is to stay hungry, humble and hearty. "When you know it is what you're good at, don't try to do everything," she said told Nikki B. in this 'Play Like a Girl' podcast. "Learn from other people who are good at other things. Don't try to be the know-it-all. Don't hide your insecurities. Ask questions. Don't be afraid to look dumb." The daughter of a college basketball coach and twin of a Division I college basketball player, Sowers' journey began as a standout multi-sport athlete both in high school and college. At the end of her college career, she pursued her first love to play football, and earned the starting quarterback spot with the Kansas City Titans of the Women's Football Alliance. She also played on the USA Women's National Team. "NFL, I'm coming for you." And now she and the 49ers are all on board.